As in previous years, this third FMS Annual Meeting will take place the day preceding the Dutch chemistry conference CHAINS (December 6-8, 2016) and in the same location (Veldhoven). 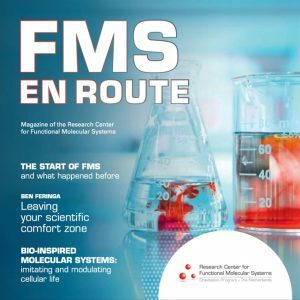 Download here the program of the FMS Annual meeting 2016. An FMS staff meeting (ONLY for FMS full, associate, and assistant professors) will take place during dinner (19:30h – 20:30h) in a separate room. The FMS Annual meeting starts at 11:00h with an FMS activity organized for all PhD students and postdocs that are considering their next step in their career and exploring their career interests, either in academia, in industry or in an alternative career path. We have invited six panelists, all chemists with different interests and at different stages of their careers. With this career panel we like to give FMS PhD students and postdocs the opportunity to learn from the experience and advice of our guests. There will be ample time for discussion and questions from the audience. Buses 149 and 150 (direction Reusel via Eersel Dorp ) depart from Eindhoven Central Station to the NH Conference Center Koningshof (bus stop Koningshof, Veldhoven). Buses depart every 15 min. approximately and the total journey takes about 30 min. Registration deadline: October 24, 2016. If you are also attending CHAINS and require accommodation on Tuesday (and Wednesday) night, we will try to assign you the same room. Important: Please note that the FMS Annual Meeting (December 5) and CHAINS (December 6-8) are two completely different events and are organized by different organizations. Therefore you need to register separately for each of them. If you are interested in attending CHAINS as well, please register on their website.